Justin Bernardo is an Associate at CT Strategies, a firm which provides strategic consulting services to clients seeking insight and innovative approaches to current border management and supply chain challenges in the U.S. and around the world. 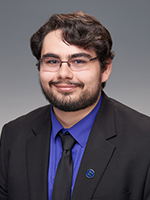 As an Associate, Mr. Bernardo supports the information technology client portfolio within the business advisory services practice through research, analysis, and overall engagement management. He additionally supports communications strategy and execution with a focus on digital media and outreach involving critical issues at the intersection of border management and emerging technologies. Furthermore, he contributes graphic design input to public-facing communication materials and is responsible for design and technical management of the company’s website. Mr. Bernardo also provides invaluable administrative and logistics support to the entire company, oversees the company intern program, and coordinates company-hosted events. Mr. Bernardo has previously worked in technology-centric roles with non-profits and educational institutions, and has experience with mobile application development and enterprise application services. As a man of diverse talents and interests, he also previously managed a music conservatory in Miami. Mr. Bernardo recently received a Master of Arts in International Affairs with a dual concentration in International Security Studies, and conflict resolution from the George Washington University Elliot School of International Affairs where he was a Merit Fellow. He also holds a Bachelor of Arts in Political Science from Boston University. CT Strategies welcomes calls for our advisory services. Media inquiries are also welcomed.